Wind and water coverage has never looked so chic. 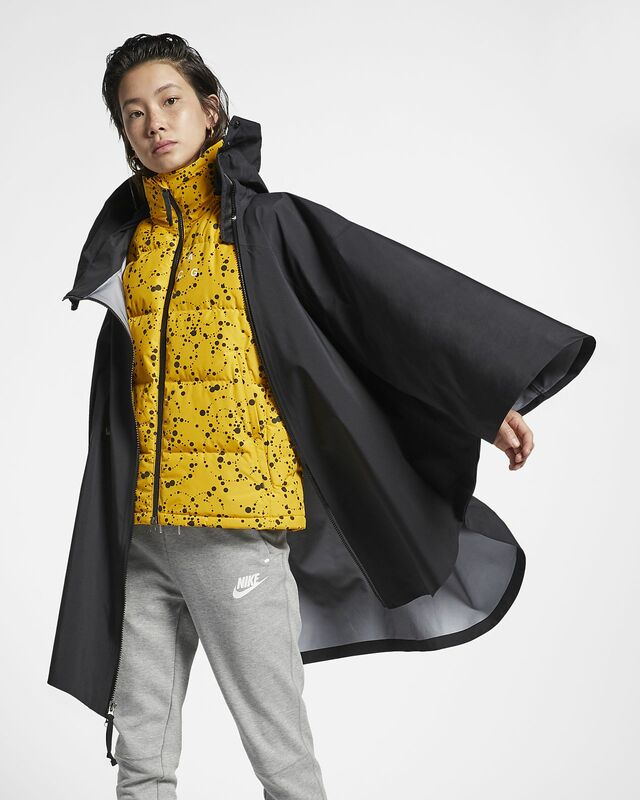 The NikeLab ACG GORE-TEX® 3-in-1 Women’s Poncho is made with lightweight, waterproof fabric with breathable technology to keep you dry, while a detachable down-fill vest adds warmth. An adjustable front pocket can tuck in or out of a zippered compartment for extra storage. A detachable down-fill vest zips into the poncho for extra warmth, and snaps let you wear the poncho open or closed. Vest pockets store your stuff on the go, while a poncho hood helps keep you covered. GORE® C-KNIT™ Backer Technology features a densely knit laminate layer that keeps you dry without adding bulk. Fabric: Poncho: 100% nylon. Vest: Body/lining/panels fill: 100% polyester. Fill: minimum 75% white goose down/25% feathers. Ready to conquer or escape the urban landscape, the NikeLab ACG Collection outfits you in modern design that tackles the elements. Wind- and waterproof fabrics and breathable technologies help keep you covered, while next-level design equips you with versatile storage and style options. Have your say. Be the first to review the NikeLab ACG GORE-TEX® 3-in-1.